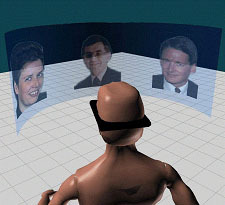 In early 2001, Mark Billinghurst, Dr. Hirokazu Kato, and I collaborated in developing a demonstration of video conferencing in a mobile, mixed reality environment. The application utilized the CharmIT wearable computing kit, along with a Sony Glasstron head mounted display, an Intersense USB tracker, and 802.11 wireless networking equipment. 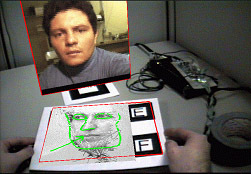 The software was based on the Augmented Reality Toolkit (ARToolkit). The system was demonstrated at the 2001 International Symposium on Mixed Reality (ISMR) in Yokohama, Japan. A detailed technical description can be found here (.pdf format).